This was one of the most special concerts I’ve ever attended, now I’ll tell you why. The Cure is a band I like since I was a teenager, so memories and vivid feelings come everytime I listen to it, of course, my excitement for this concert was like a kid with a new toy. My friends and I arrived to the Foro Sol soon in order to listen to the third support act, Andrea Balency, whose performance was just ok. Then, we waited patiently for the legendary band to come to stage. But wait, one of the things that made this night so special was something really unexpected, I was stood watching the stage while all of a sudden I felt the ground was moving, and it was moving and shaking like crazy because a 5.8° earthquake was happening at the moment. The Forum’s light-pillars were also shaking like if they were about to fall down, and though it was a scary moment, the audience were saying like “wow, this is the prelude of something memorable”, and it was. Twenty minutes later The Cure appeared, we already knew this would be a special night because it was Robert Smiths’ birthday, so we cheered them loud and then the show begun with “Open”, of course followed by “High” as they normally use to play. There was an issue that I must mention since now, because it marked the night, negatively, sadly, and it was that the sound was so low and not good equalized, I don’t know if from another zones it was better, but from the one I was there were moments when the sound did not help and made us feel a bit disappointed about it. So it was a contrast between feelings, emotions and the sound which was not the optimum. Some classics came in the first bunch of songs, such as “Lovesong”, “Push” which I really adore and made me sang like crazy, or “Just Like Heaven” which was shouted at heart by all the crowd. The band looked happy and enjoying the night; maybe one of Mexico’s people charm is that we always have a good vibe that the musicians can easily feel, so the communion between artist and crowd is always excellent, this time it was not the exception. 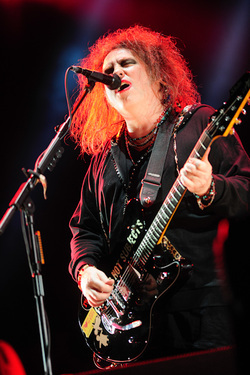 The sentimental effect The Cure provoke is terrible, their songs move people and touch them in their deepest bowels, one example of that was with “Pictures of You”, if one looked around, people were excited, singing, dancing, even crying. Depressive, nostalgic, but also happy songs are what they offer, so it is a cool mixture of emotions, an example of it is the contrast between songs like “Lullaby” and “Sleep when I’m dead”. But well, one of my absolute favorite moments in the night came next with “Play for Today”, which is one of my top Cure songs, but also had something special because before the voice entered we chanted the keyboard tune, and it was a massive chorus that made us feel free, and made the band really happy. Immediately after the band was like jamming, but it was a longer introduction to “A Forest”, which of course, was another of the highly appreciated moments of the night, we danced like crazy and screamed again and again and again and again and again. The next 3 or 4 bunch of songs was cool but not the best, until “Friday I’m in love” appeared. I don’t know if that was the climax of the night, but at least one of the 3 best moments because the Forum gathered thousand of voices and all became one, the sound of people singing and feeling that love was so beautiful. After that moment I can say the show turned a bit darker, and after of the adrenaline rush, the revolutions of our souls settled down for like 30 minutes, with songs such as “Trust”, “Want”, “One Hundred Years” and “End”, the last of the first set, which featured 25 songs. So imagine, 25 songs for the first set was already a killer, but we will have more, much more, and we knew it. So while we were waiting for the first encore, we started singing happy birthday, making Robert feeling like home, embraced by our spirits. Of course, a couple of minutes later The Cure returned and started with “The Kiss”, a wooonderful song whose beauty I hadn’t noticed before, honestly after the show I’ve been listening to it so many times, and live was a highlight at least to me. Another great piece came next with “If Only Tonight We Could Sleep”, whose dark feeling and slower tempo was perfect for that evening. The first encore finished with “Fight”. Some of my friends were kind of disappointed at that moment because they thought that would be the only encore, and that some of their favorite songs would not be performed, but they didn’t know what the band would give us. So a second encore now, with three songs from Disintegration. First it was “Plainsong”, which I honestly thought would open the show; later “The Same Deep Water As You”, a longer song and one of the darkest of the album, it was great to listen to it live. And finally my post precious moment of the night, because I have a personal issue with “Disintegration”, it was my most awaited song, so as you can imagine, I broke to pieces, sang as if the world would end tomorrow, and cried like a baby. That song touches me a lot, I didn’t even imagine how much. Knowing they were playing Disintegration songs, of course we were asking for “Fascination Street”, however the encore finished and at least I thought they would not play it. But a third encore was done! Seven songs this time, something really unexpected, because we already knew they played a lot of time, but they would surprise us much more. “Shake Dog Shake” and its sympathetic sound opened this encore, and songs like “A Strange Day” and “”The Hanging Garden” continued, just before the long awaited “Fascination Street” was played. People became crazy, it was another of the most memorable moments of the night, though I could barely listen to Simon’s bass. My main surprise would come some minutes later when I listened to the keyboard of “Charlotte Sometimes” another of my top songs, and one I thought they would not play. So I got terribly excited once again. Later “Primary” appeared and the band disappeared once again. Once again? Yeah! That means there would be another encore, something incredible and unique. So Robert returned and told us it was his birthday so this would be a very special night. This set would feature some of the earliest Cure tunes, so we were preparing ourselves to dance like crazy and leave our last effort after a so long show. Here we could enjoy songs like “The Lovecats”, “The Caterpillar”, “Close to me” or “Why Can’t I be You”, in which sadly I could not listen to O’Donell’s keys. We were a bit tired and sweating, but with huge smiles. So the band except Robert left the stage, he stood and with his acoustic guitar surprised us with solo performances of “Three Imaginary Boys” and “Fire in Cairo”, whose chorus sounded powerful with our voices. After a wave of applauses Smith began to play the chords of “Boys Don’t Cry”, so the band returned and played it and made us happy, my friends and I hugged each other from the shoulders and sang along it. It was like wow, but it was not the end, because later “10:15 Saturday Night” begun and we become crazy once again, jumping, dancing, moving, doing everything, enjoying life. Finally, the bass lines of “Killing an Arab” sounded and with this legendary song the concert finished. Unbelievable but true, The Cure played 50 songs during more than 4 hours! So, though we wanted to give Robert a birthday gift, the ones who received a extraordinary gift were us. A one of a kind experience without a doubt, priceless!